Marks Fabergé, HW, assay mark of St. Petersburg 1908-17; miniatures signed and dated "V. Zuiev 1912"
This is one of the few Eggs for which the original design has survived. In 1992 an album of drawings from the workshop of Henrik Wigström, Fabergé's leading workmaster from 1903-1918. The volume was discovered at a home in Finland in a bookcase that had not been touched for decades. The owners had been former neighbours of the Wigström family who fled to Finland after the Revolution and this was the source of the item. This egg commemorates the centenary of Russia's victory over the armies of Napoleon, and in particular the victory at Borodino, in 1812. Double-headed eagles and battle trophies embellish the green shell. 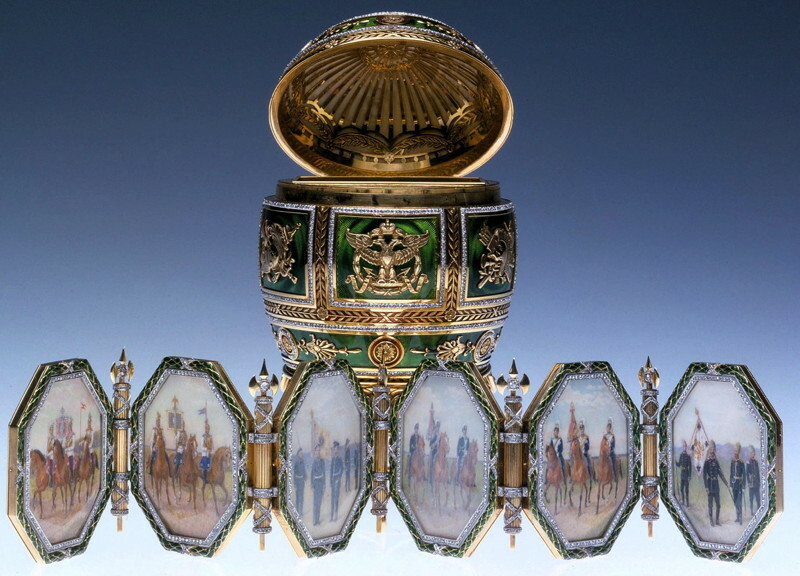 Like enormous history-painting cycles from earlier centuries, the Napoleonic Egg celebrates past royal glories while appealing to Russian patriotism at a time when the Romanov dynasty once again faced the uncertainties of war. 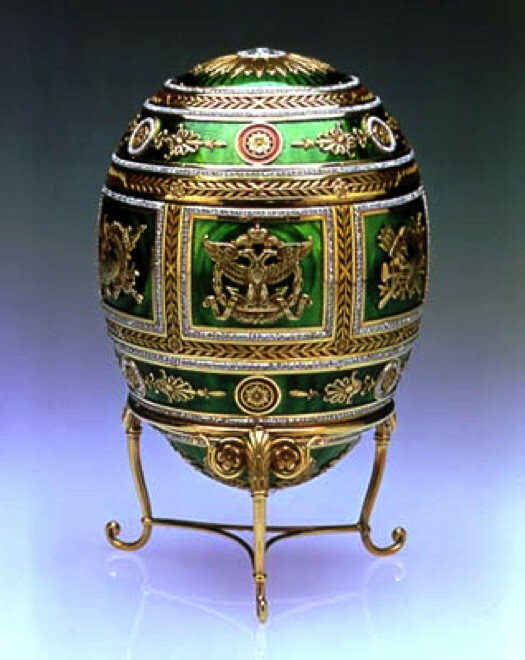 As we said, the Napoleonic Egg is one of only two Imperial Easter Eggs for which design drawings have so far been found, the other being the 1909 Standart Egg. The invoice for this Egg is missing. 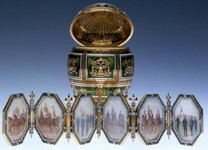 However, it is known from the account books of His Imperial Majesty's Cabinet that the two Eggs for 1912 - which are this one and the previously described Tsarevich Egg, cost 50,897.5 roubles. The USSR's Antikvariat sold the Napoleonic Egg in 1930 for 5000 roubles.In 1930 the Napoleonic Egg was one of the ten Eggs sold to the Hammer Galleries, New York. 1937 was in a private collection. 1951 owned by Matilda Geddings Gray, oil-heiress. 1971 Collection of the late Matilda Geddings Gray, 1972 Matilda Geddings Gray Foundation, New Orleans Museum of Art, USA. 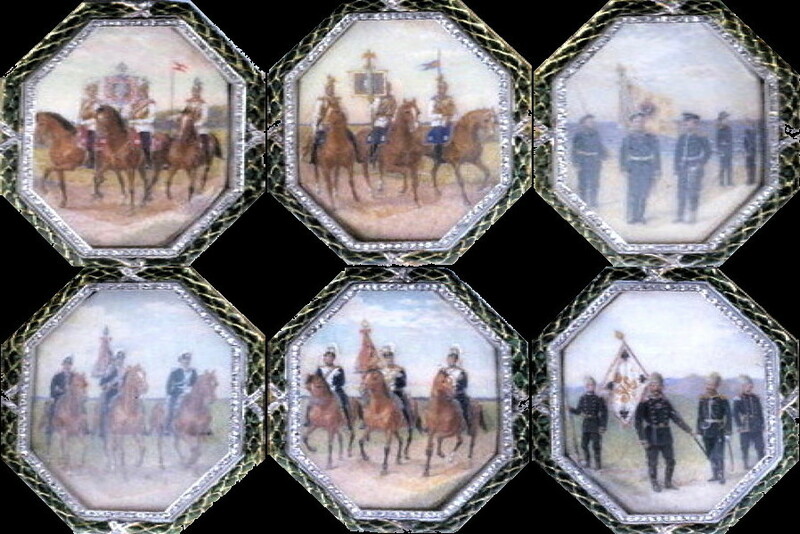 The surprise within the Egg is a folding screen of six miniatures, each representing a regiment of which the Dowager Empress was honorary colonel for the six regiments depicted in watercolor, and her monogram decorates the back of each panel. These panels, signed Vasilii Zuiev and dated 1912, form a screen whose hinges are ax-topped fasces, a warlike emblem in use since Roman times. Painted by Vasilii Zuiev, the miniatures are very fine and detailed. 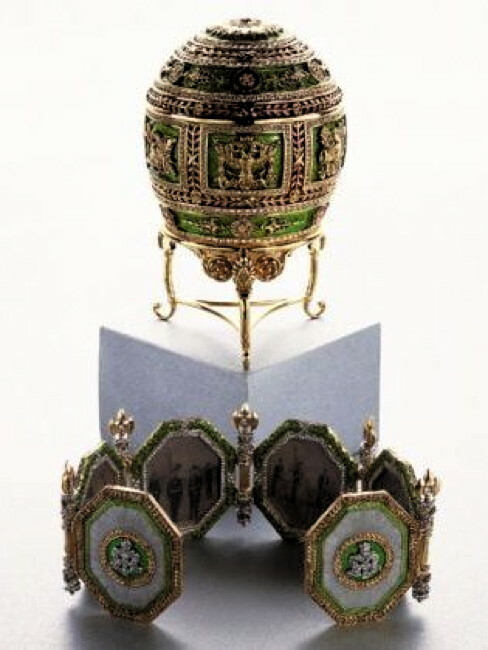 The elongated octagonal frames are superior to any other frames found as surprises in the Imperial Eggs. The apertures surrounding the images are pavé-set with rose-cut diamonds, while the actual frames take the form of enamelled laurel wreaths bound together with bands of diamonds.